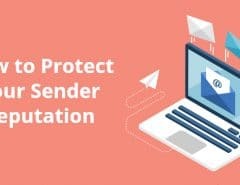 Picture this: the CEO of a reputable company fills up a form on your site to download an eBook, and after you reach out to them and tell them about what your company does, they respond favorably. Score! 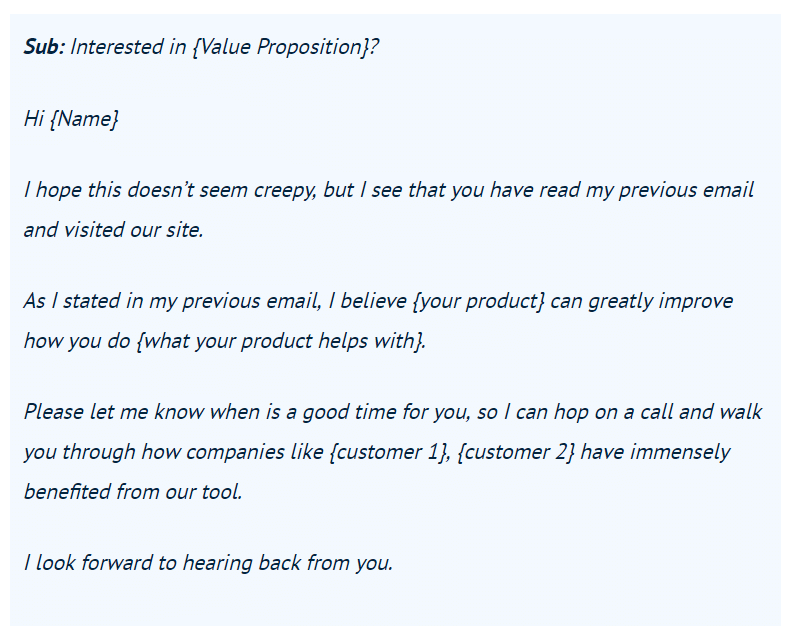 So you email back, hoping to set up a product demo for them – but then they don’t respond..
You wait. And wait. And wait. Still, zilch… you’re not getting a reply from this person. Instead of sitting around and twiddling your thumbs, you’ll want to follow up with this person, and try and get back on track. After all, they’re a potential customer, and you shouldn’t let the sale go as easily as that! Not sure how to follow up? In this blog post, we share 15+ sales follow-up templates that will streamlines your inside sales process, and increase the replies that you get. According to statistics, adding just a single follow-up email to your campaign can help you convert 22% more prospects. Pretty powerful, huh? At the end of the day, remember: the leads you’re emailing are busy folks, and they probably receive tens or hundreds of emails from sales reps in their inboxes, every single day. Bearing this in mind, if your initial email doesn’t get a reply, don’t assume that your lead isn’t interested, or that they’re rejecting you. It could simply mean that they haven’t seen your email, or that they’re too busy to respond. Pro-tip: how many times should you follow up? As many as the situation calls for. While most reps follow up once or twice with their leads, and then give up, following up for a fourth, fifth or sixth time can actually make a difference. Moral of the story? Be persistent, and keep reaching out! Need some inspiration? 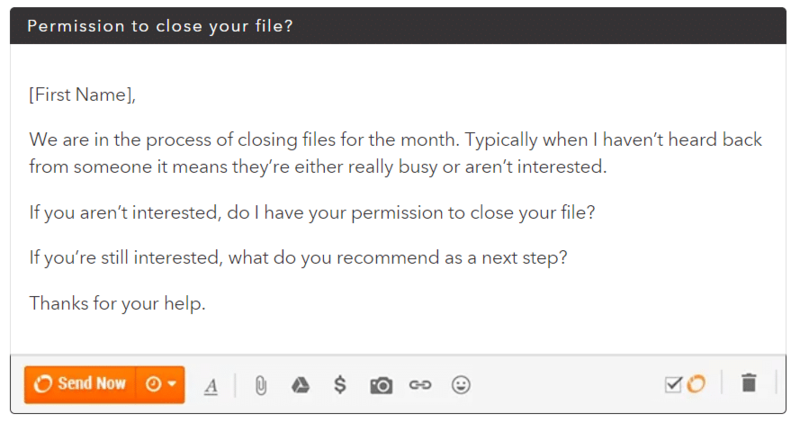 Here are 16 examples of follow-up emails that you can steal. With this email, you’re basically calling your lead out for ghosting you – but doing so in a way that’s not overly aggressive. 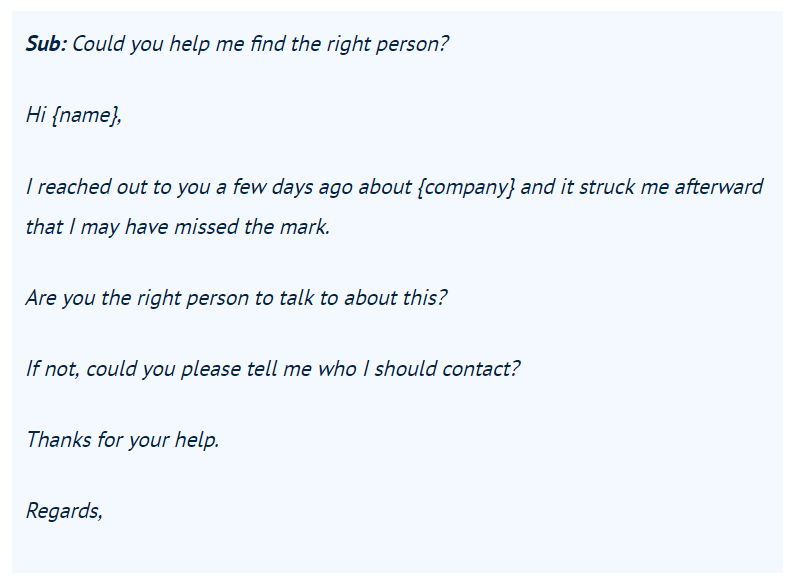 With any luck, your lead will feel bad about being unresponsive, and get in touch with you immediately. Again, the beauty of this email lies in the fact that you’re calling out your lead in a way that’s not rude or aggressive. 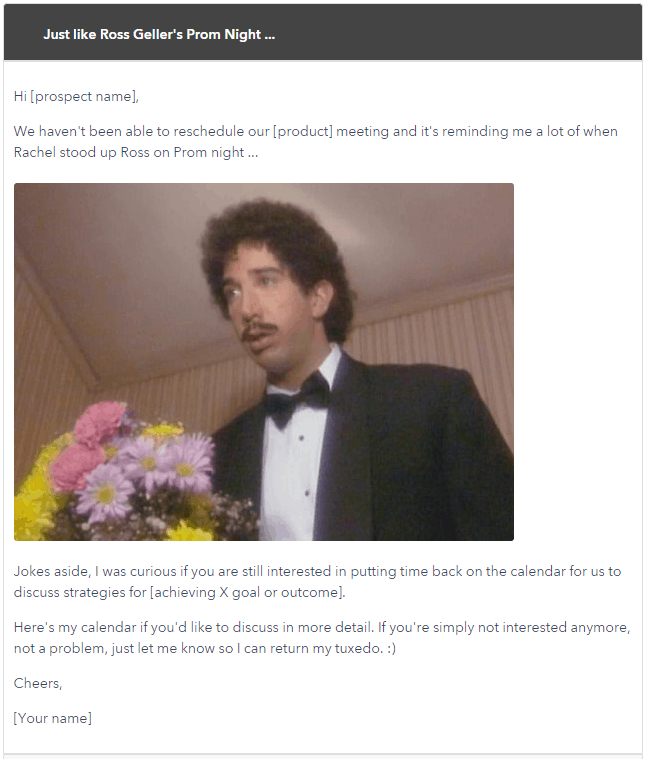 That said, be sure to only use this email for leads who are, say, in their 30s and beyond – those who are younger might not get the Friends reference. 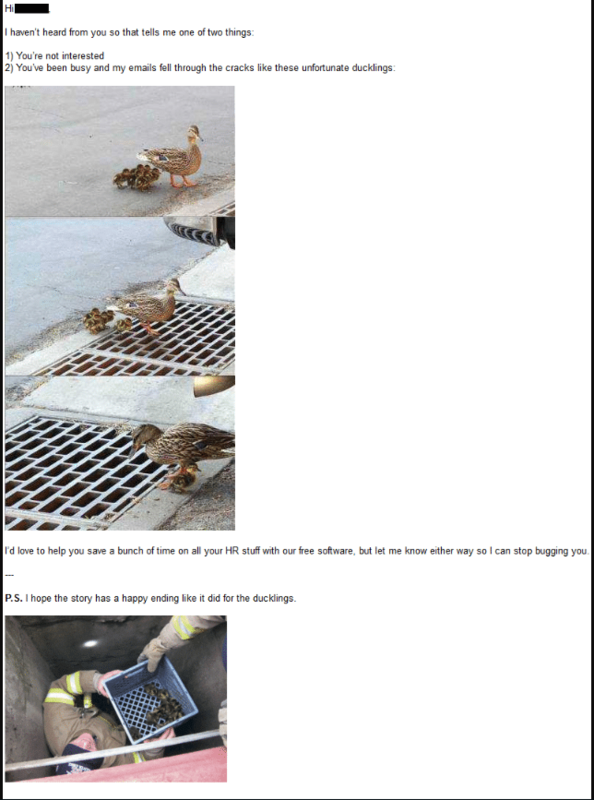 The baby ducks are a nice touch, but on top of that, we also really like how the email makes it easy for the lead to respond. Here, you’re basically laying out the two options, and asking your lead point-blank: which is it? In the case that your lead doesn’t want to move forward, they can simply say: “You’re right, I’m not interested” instead of ghosting you because they don’t know how to tell you that they’re just not keen. If you’re wondering where’s the rest of the email, that’s it. Yup, you’re just sending your lead a GIF of cookie monster, with no additional text. 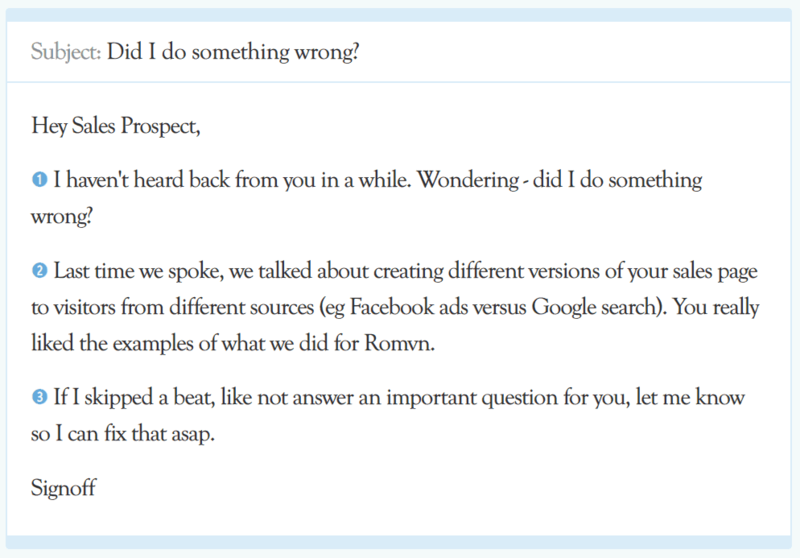 This email is funny, and it also stands out – unlike a standard follow-up email, you’re not attempting to sell your company or convince your lead here. At the same time, the email makes a very clear point (that you’re waiting for your lead to get back to you). According to Close, it generates awesome response rates. We all know that video is a highly engaging medium, so what better way to grab the attention of your lead than to send them a follow-up email with a video? 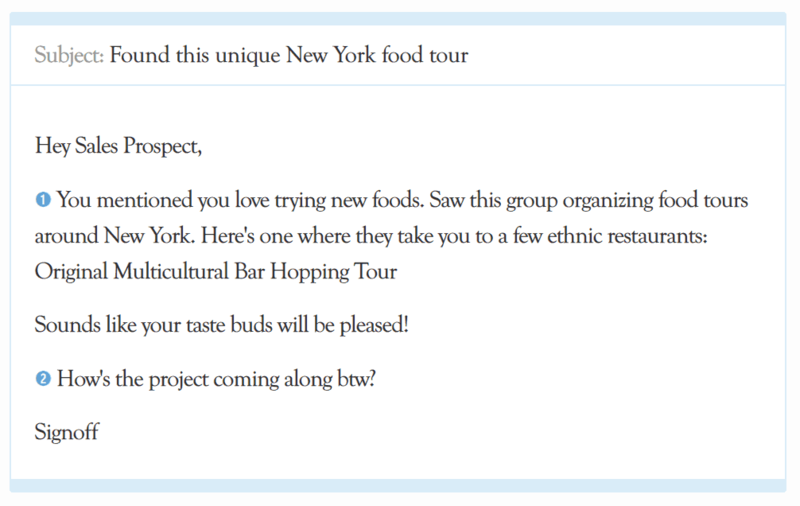 This particular email that you see is actually an onboarding email, but you can craft a follow-up email the exact same way. 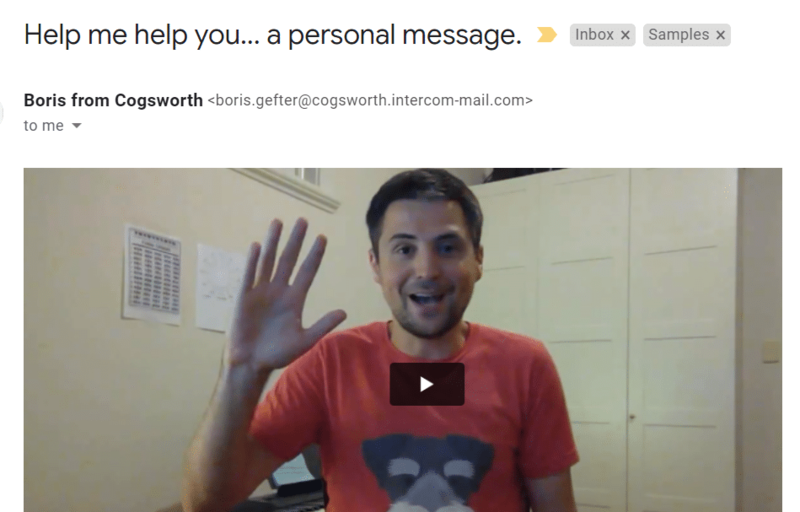 Simply come up with a compelling email subject line, then embed a video of yourself speaking to your lead in the email body. The more “human” and the less corporate/polished this video looks, the better your response rates will be. You can use a tool such as BombBomb to record and send your video. If you’re sick and tired of not hearing back from your lead, and you want to get a definite yes/no from them, this email will be right up your alley. Again, you’re laying out all the options for them – this makes it easy for them to reply (regardless of whether they DO want to continue the conversation, or if they’re not interested in working with your company). 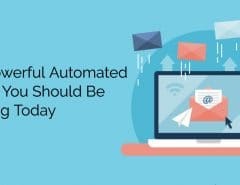 Sales reps can sometimes come across as one-dimensional, so if you can humanize your sales and follow-up emails, this will definitely help you stand out from the crowd. With this email, you’re acknowledging that it’s annoying to receive emails (about the same thing!) over and over again. This, in turn, shows that you’re respectful of your lead’s time, which wins you extra brownie points. At the same time, the email also brings up a good point (that you’re trying to help your lead), and it reminds your lead that you’re bringing value to them. Say your lead responded once to your first email, but then ignored all your subsequent emails. This could mean that they’re somewhat intrigued by what your company has to offer, but that your pitch isn’t compelling enough for them to take the conversation further. Yep, this follow-up email DOESN’T mention following up at all. Instead, you’re throwing a new piece of information out there, in the hopes that your lead will bite. Even if you’re sure that you haven’t missed out on anything, try sending this email anyway. Your lead will (hopefully!) feel bad that you’re second-guessing yourself, and reply to reassure you that it’s not you, it’s them. Once you’ve established what it is that’s holding them back (budget? Timing? Approval issues? ), you can then figure out how to solve the problem. If being straightforward isn’t working for you, you might want to try using a roundabout approach to entice a response from your lead. 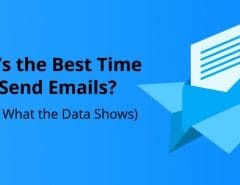 Now, these emails can be pretty powerful, because they show your lead that you’re paying attention to the small bits of trivia that they mention about their life, and that you’re taking an interest in them (as an actual person). This helps to build rapport and trust, and increases the chances that your lead will make time to respond to you. 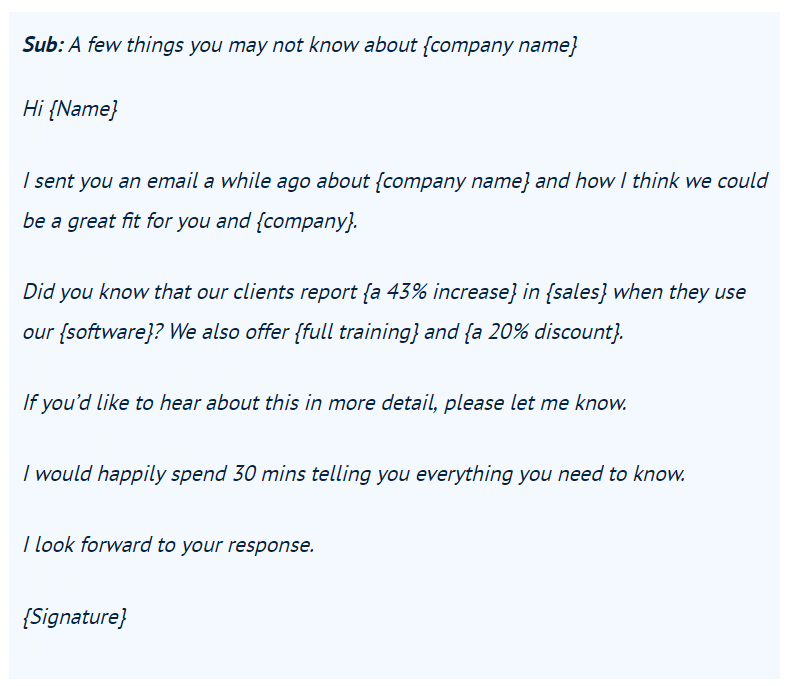 Now, because you’re throwing out the fact that your lead can get full training and a discount upon signing up, this makes your offer that much more attractive. On top of that, referencing the results that you help your other clients achieve (43% increase in sales, etc) is also a nice touch. You might also want to talk about the ROI that an average client experiences with your product/service; this will further convince your lead that your company is worth investing in. Here, you’re encouraging your lead to hand off the discussion to someone who might be able to better facilitate it. Unless you’re 100% sure that the CMO / marketing director / whoever you’re talking to is the person who takes care of new product/service purchases, it’s definitely worth giving this tactic a shot. Say your lead mentions that they’re not quite comfortable with the price of your company’s products/services, and then goes radio silent. First off, the email addresses how you understand your lead’s POV, and you would raise the same concerns as them if you’re in their shoes. This automatically tells your lead that you’re on their side, and you have their best interests at heart. 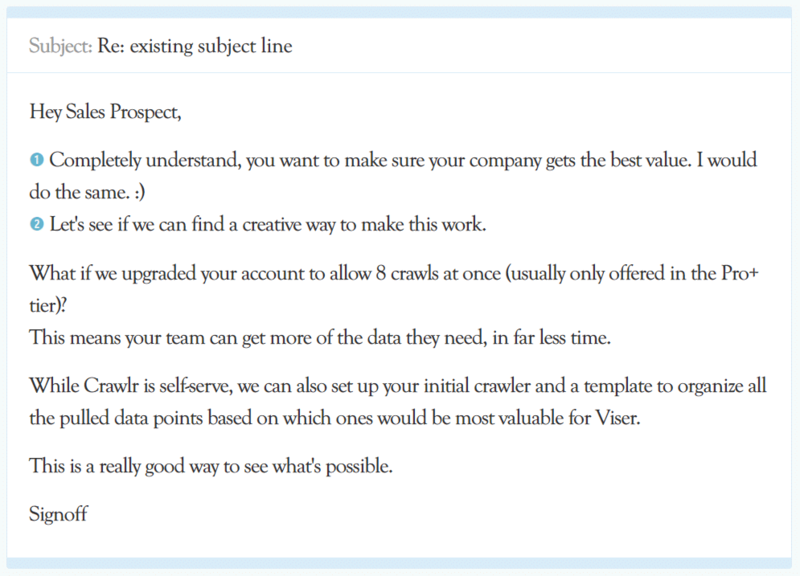 On top of that, you’re also offering a compromise by offering your lead more value/usage for the same fixed price. The way we see it, this is a win-win… your lead is happy because they get more out of your tool, and it doesn’t cost your company any extra to serve your lead. Of course, make sure you have the go-ahead from upper management before you go ahead and send this email! If you’ve been researching follow-up emails, you’ll know that there’s a category of these emails termed “break up emails”. These are best used in the case where you’ve followed up with your lead over a prolonged period of time, and they’re still not replying. Here, you’re basically giving your lead an ultimatum, and telling them that you’re not going to be chasing them down or bending over backwards to get their business anymore. If your lead is truly interested in doing business, they’ll get in touch with you, and you can take the conversation from there. If not, then you can move on, and spend your time on your other leads who are interested in working with you. Again, this email is great for a situation in which you’ve pulled out all the stops to pitch to your lead, but they’re still not responding. Take note of how the email is written in a lighthearted, non-aggressive tone: this is important, because you don’t want to burn bridges with your lead. There’s still that chance that your lead might reach out 3, 6, or 9 months down the road, and tell you that they’re now ready to make a purchase. The key to closing more sales? Following up relentlessly. 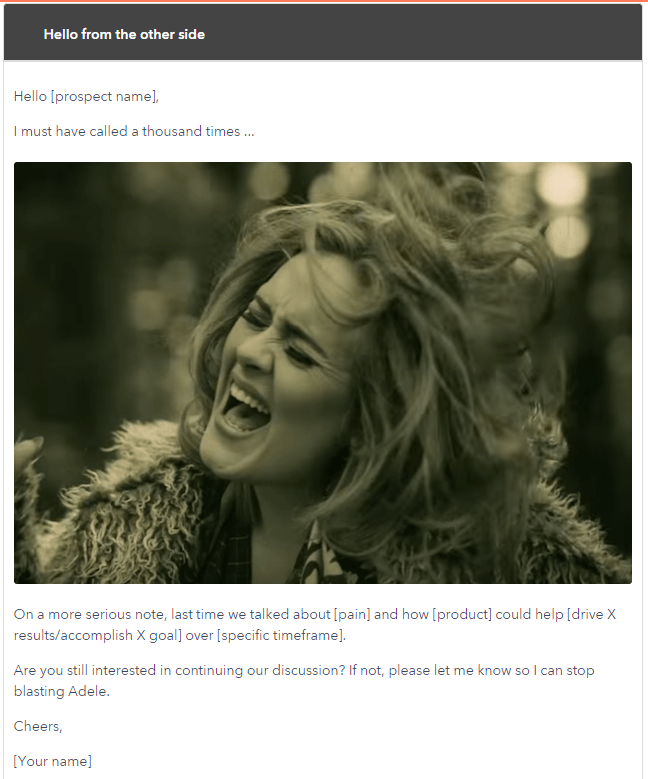 If you’re a sales rep, you’re going to be ignored and ghosted – simple as that. The sooner you learn how to be comfortable with following up (and being persistent), the sooner you’ll experience more success with closing your leads. Want to improve your conversion rates? Pick a few of your favorite follow-up templates out of the 16 we’ve outlined here, and start using them with your leads. Then watch as you start getting more replies in your inbox! Will Cannon is the founder of UpLead, a B2B sales intelligence platform that sales reps and marketers can use to get in touch with their ideal customers. With UpLead, you can reach out to decision makers in any company with zero fuss.